K. Meira Goldberg, flamencologist at the Foundation for Iberian Music and director of our “Spaniards, Natives, Africans, and Gypsies” conference series, will be performing Sundays in June at La Nacional! With her director Rafael Abolafia (researcher at the Graduate Center’s Segal Theater) and fellow dancer/guitarist José Moreno, she has created an experimental flamenco work called Raíz. 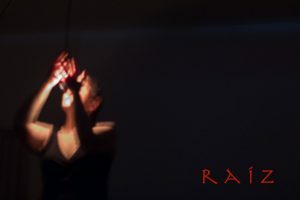 Raíz seeks to create a ceremony of perforation and immersion in the rites of flamenco. The piece is fractal in its conception, jagged in its edges. It emerges from the poetic and transgressive realism of arte povera: a return to simple objects and messages, a stage where traces of nature and industry become alive. The Crone embodies the strength of instability. She enacts rejection and rebellion, memory and faith, feasting and solitude. Her pilgrimage maps a homeland containing many forces in tension. We wish to generate a contemporary quejío, to open spaces and sensations where our wings may find ground and our roots take flight. Raíz will have four performances, beginning June 4. Tickets are $20 and available through Eventbrite.